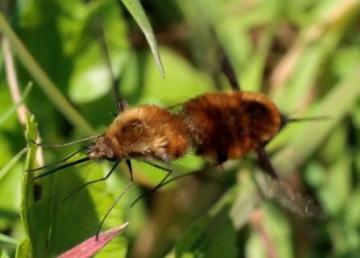 It prefers warm days, when it can be seen hovering above bare ground or at flowers. Identification is relatively straightforward: its long proboscis distinguishes it from almost any other insect at this time of the year. Combined with this, the body is covered with a fur of golden hairs and the wings have a solid black leading edge. 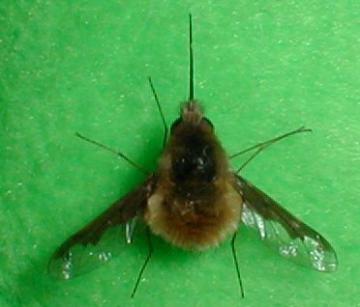 There is only one other species of large bee-fly in Essex, the very rare Dotted Bee-fly (Bombylius discolor), which has only been recorded once in the last 40 years. This species is distinguished by having spots on its wings instead of a dark band. We would welcome any observations of either of these species during the coming spring. If you believe you have records of B. discolor please contact us and support your record with a voucher specimen or good photograph. We invite the submission records or specimens of flies from this group (which includes the horseflies, soldierflies, robberflies and snipeflies) in order to gain an understanding of the modern distribution and status of these insects.